Institut für Softwaretechnik und Theoretische Informatik: What is Usability? Sie sind hier: What is Usability? The majority of systems and services which are provided by computer science, electrical engineering and information technology, finally address the human user. As a consequence, it is essential to understand the user and his interaction behaviour for designing successful systems and services. Formal principles for the interface design can be based on this knowledge, as well as demands on the technical components underlying the system. In turn, the availability of new technologies may lead to innovative interface design, and finally to new forms of interaction. 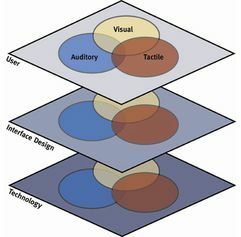 the layer of the fundamental technologies the interaction is based on. On all three layers, different media or modalities and combinations of these may be considered. The most relevant ones for practical applications are the acoustic, the visual and the tactile interaction. We address interactions both between human and machine (e.g. speech-based interfaces, web interfaces, interactions with avatars and in virtual or augmented environments) and between humans by means of a technical system (speech and multimedia transmission through wireline or wireless networks, translation systems, etc.). In order to design high-quality and highly-usable systems and services, quality and usability has to be measured and analyzed in a consequent way. Thus, quality and usability are considered to be the result of a measurement and a prediction process, in which the characteristics of the system are put into a relationship to the demands of the user. On the one hand, the performance of the system and its underlying components has to be measured in a quantitative way. On the other hand, the user’s perceptions and requirements during the interaction with the system have to be quantified. The latter may be accomplished by means of auditory and visual experiments with human participants. During these experiments, the characteristics of the systems are usually well defined (e.g. by means of simulations), and the behaviour and the perceptions of the user are collected and recorded. The characteristics of the system can then be correlated to the user’s perception, and thus design principals can be derived for the system under investigation. In an ideal case, quality and usability of a new system or service can already be predicted in the planning or design phase of system development. Models which are able to carry out such tasks must quantify quality in a valid and reliable manner, so that the prediction results correspond to the judgments of a human user (which is a direct quality measurement). By combining quality and usability measurement and prediction, systems and transmission networks can be adjusted to the user’s requirements in an economic way; this will highly improve the success and the acceptance of technical systems. For students in electrical engineering, information technology and computer science, the topic as well as the approach described above offer the advantage that they learn to estimate the effects of the systems they develop on the user, and that they get excellently prepared for interdisciplinary cooperation. Thus, the Quality and Usability Lab offers courses on all three layers: technology, interaction-design and user. to implement the described methods in the cycle of specification, planning, design, implementation, optimization and monitoring of new systems and services. as well as – in a broader sense – all systems enabling a multimodal interaction between humans, machines, and the environment (virtual environments, augmented environments, context-sensitive systems, etc. ).